Deakin (Josh Dibb) will release his debut solo album sometime in 2011. In a recent interview with Jarrod Dicker that we published on this site, Deakin discussed the idea that his new songs were “taking their time working themselves out”. These two recordings are evidence of that process. At the early part of his tour with Prince Rama, Deakin played a hour-long set at Glasslands, a gig which was essentially his first solo show in NYC. With working song titles, he performed all new material. While the songs maintained a loose melodic structure, the sound was heavy in vocal reverb and musical echo. As the tour progressed, the songs began to take shape, so that by the time Deakin returned to NYC to perform a set at Music Hall of Williamsburg in November, the material contained tighter melodies and relied significantly less on echo effects. The songs still are labeled with working titles, but are far closer to the anticipated finished versions than in September. Josh provided us with the titles and track breaks for both of these recordings and approved the post with the caveat that these performances represent stages or snapshots in the evolution of the material. We expect that the songs will continue to develop and the finished product may not even closely resemble what you hear on these recordings. 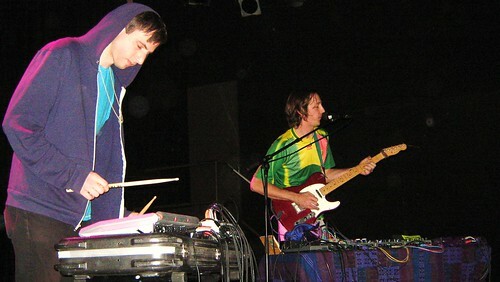 The Glasslands set was recorded with a soundboard feed mixed with the Neumann microphones placed in front of the soundboard booth. The sound quality is quite clear, if a bit lacking in room feel. The Music Hall recording was captured with the four microphone rig from directly in front of the board cage. The sound quality on each recording is distinctly different from the other, but the overall quality is excellent. Enjoy! If you download this recording from NYCTaper, we expect that you will PLEASE SUPPORT Deakin, visit his MySpace page, and purchase his debut solo album when it is released by Paw Tracks Records in 2011. To both taper and deaken. Tim Dewitt is on stage with him! hoo it’s nice to see him again!